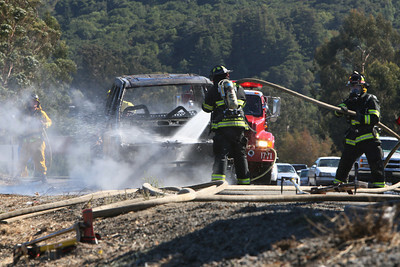 According to Woodside Battalion Fire Chief Kevin Butler, at 3:48 pm, the Woodside Protection District received a call of a vehicle fire on 280 southbound near the Edgwood Rd. exit. 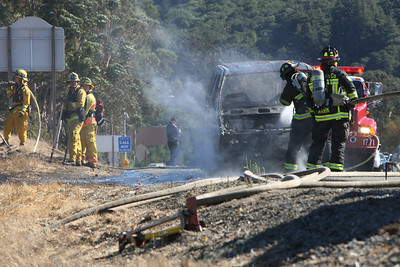 They and Cal Fire responded to the scene, which was upgraded to a ÒWild LandÓ fire as fire from the vehicle spread to the vegetation on the side of the highway. 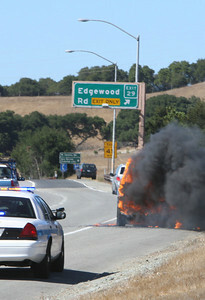 The Driver of the vehicle Denise Burke experienced vehicle failure while driving Southbound on 280. As she pulled her dark green 1993 Ford Aero Star mini van to the side of the road, she noticed smoke coming from under her dashboard. 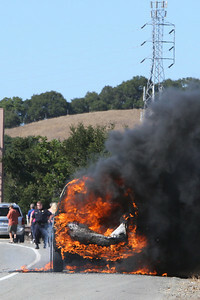 Denise was the only occupant of the vehicle and got out safely. 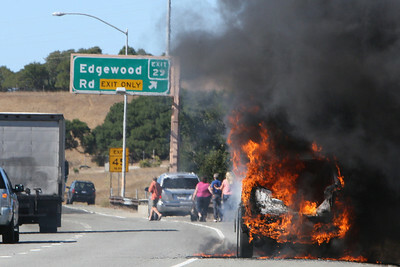 Bystanders tried to put out the flames but were held back by the driver. Initial calls to 911 were unsuccessful and the Fire Department was contacted via the operator. 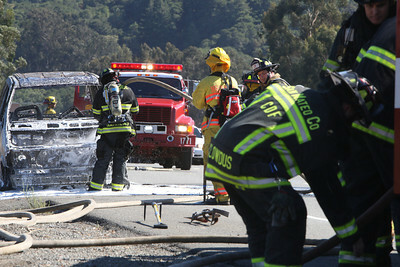 The vehicle was consumed in flames when the firefighters arrived but it and the surrounding area was under control within 10 minutes. Protective foam was dispersed to prevent a re-kindle of the flames. No injuries were reported. Traffic was backed up for a short period of time.